We engaged with Tendersoft not knowing what we would get for the price point but figured we should give it a try in case it worked out. We’ve dealt with many other development companies over seas and have struggled with the usual language and cultural differences. 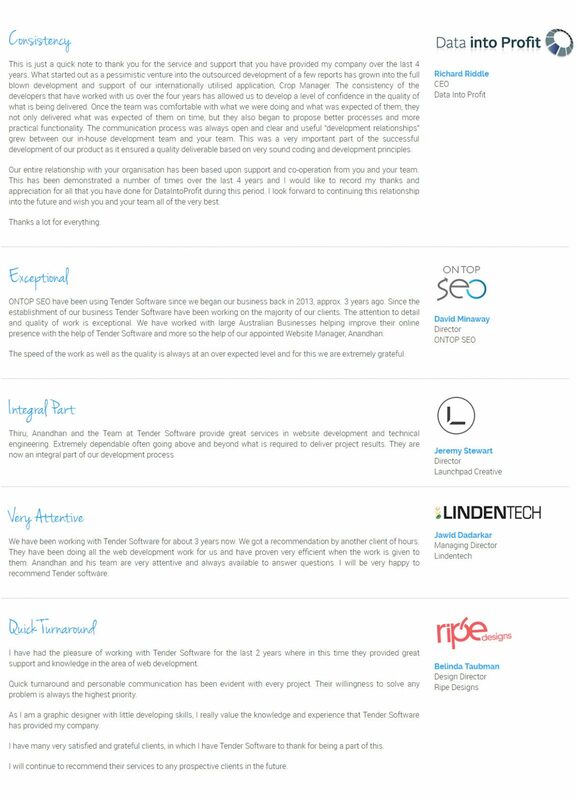 Tendersoft has been a great experience and met all our expectations. Their American representative in the US provide a conduit to the development management team. The team we interact with in India has excellent grammar and speak English well. This makes reviewing the project requirements much easier although most of this is done via Skype. The bottom line is that we could never do the things we are doing without the excellent price point as well as the excellent program implemented by Tendersoft. Feel free to contact me to discuss our experience. Having worked with dozens of programmers over the past several years, I can assure you that Tender Software is outstanding. We absolutely love the work they do and highly recommend them to anyone considering outsourcing programming. The work they provide is clean and beautiful software programming. If you want the job done right the first time this is the team. Their pricing is spot on perfect, too!